Because of their antimicrobial properties, silver nanoparticles (AgNPs) have been widely used and have come into contact with the environment. In the present work, an effect of AgNPs on a standard soil organism, Folsomia candida, was studied (in comparison to silver nitrate) focusing on molecular and cellular alterations as ecotoxicological endpoints. At the molecular level, an up-regulation of metallothionein-containing protein (MTC) mRNA in AgNP-treated groups indicated toxic heavy metal stress effects caused by the release of silver ions from AgNPs, which is similar to animal groups treated with silver nitrate. Alteration of the steady-state level of glutathione S-transferase (GST) mRNA was detected in animal treated with AgNPs and AgNO3. At the cellular level, the relation between GST activity and the size of the glutathione (GSH) was examined. Change of GST activity from different animal groups was not significant, whereas the GSH pool (reduced and oxidized forms) decreased with increasing concentration of AgNPs. In order to obtain direct evidence whether AgNPs cause oxidative stress, treated animals were incubated with the non-fluorescent probe, 2′,7′-dichlorodihydrofluorescein diacetate (DCFH-DA). A fluorescence signal was observed in both AgNPs- and AgNO3-treated groups pointing to the production of reactive species (RS). Since RS formation in F.candida is difficult to quantify, yeast strain BY4742 (wild-type) and mutants lacking of oxidative stress-related protective enzymes were exploited as a further eukaryote model organism. AgNPs and AgNO3 were found to also affect growth of yeast and induced oxidative stress. An effect of AgNPs on Collembola and yeast strains is similar to the one from AgNO3. However, AgNPs is less toxic due to the slow release of silver ions. In summary, the toxic effect of AgNPs on F. candida is caused by the combination of the release of silver ions from AgNPs and the formation of reactive species. Because of their antimicrobial properties, AgNPs have been extensively used in many applications, for example, in textiles, wound dressing, and other medical devices by coating or embedding [1, 2]. AgNPs have unavoidably become part of everyday life and thus are in close contact with human beings and the environment. One possible emerging problem arises from the leakage of AgNPs directly into wastewater . Blaser and co-worker  proposed that silver is removed from wastewater at treatment plants and deposited in sewage sludge produced from wastewater treatment. The release of AgNPs to the environment is due to the accumulation in sewage sludge, which is applied as fertilizer in agriculture . At this stage, the re-use of sludge can possibly cause soil and groundwater pollution . Mueller and Nowack reported in their modeling study that the use of sludge as fertilizer released approx. 1 μg nanosilver per kg sludge per year . Some authors speculated that given the limited quantity used, it is unlikely to be a major environmental threat . However, the sewage treatment plant simulation showed that at environmentally relevant concentration more than 90% of AgNPs are bound to sewage sludge and at this concentration, AgNPs absorption to sludge as well as aging in soil have the toxic effects on microorganisms . On the one hand, the practical intent of AgNPs is to disinfect or sterilize a specific type of target organism, in this case toxicity may be interpreted as positive outcome. On the other hand, AgNPs can cause undesired effects on non-target organisms and such toxicity may then pose a potential hazard . Toxicity studies of AgNPs have been widely done during the past decades with animals  and mammalian cells [11, 12] including human cells [13, 14]. Lim and co-worker investigated the toxic mechanism of AgNPs in the nematode Caenorhabditis elegeans, focusing on the involvement of oxidative stress in toxicity to the reproductive system . The results indicated that exposure to AgNPs led to increased ROS formation, increased expression of PMK-1 p38 mitogen-activated protein kinase (MAPK) and GST enzyme activity and decreased reproduction, which suggested the role of oxidative stress as a significant mechanism of AgNPs-induced reproduction toxicity. Apart from the study in roundworm, Arora et al. explored the effects of nanoparticles on human fibrosarcoma and human carcinoma cells and illustrated that in the presence of AgNPs, the cellular level of glutathione (GSH) was reduced, indicating oxidative stress . The present work investigated the effects of AgNPs on standard test soil organisms Folsomia candida (Collembola), which have been used as a representative species to study and highlight the effects of chemicals on organisms because of their ease of culture in laboratory and short generation times. Several ecotoxicological tests, including reproductive test , metal exposure test , and acute test  have been introduced in F. candida. Although toxicity endpoints (commonly from acute and chronic tests) are routinely used with this species as an input for calculating the Risk Quotient (RQ) in ecotoxicological risk assessment, they provide only a single estimation of environmental risk. The development of more sophisticated methods for conducting ecological risk assessments such as molecular or cellular changes under stress conditions may thus be a promising alternative  and can demonstrate a higher sensitivity and response in the initial stages of stress impact . Therefore, in this study, we investigated the effects of AgNPs (in comparison to AgNO3) on the test animals focusing at the molecular biological organization level including the expression profiles of target genes as well as at cellular (biochemical) biological organization level by following changes of GST activity and the total GSH amount. Moreover, we studied whether the molecular and cellular changes caused by chemical stress could be used as potential ecotoxicological biomarkers for sub-lethal effects in F. candida. Furthermore, reactive species (RS) formation in test animals exposed to AgNPs and AgNO3 was also investigated. The chemical effects were also studied with Saccharomyces cerevisiae strains BY4742 and its mutant derivatives by treating them with AgNPs and AgNO3 in order to assess the possibility of exploiting yeast as a eukaryotic model organism in ecotoxicological testing, since it shares complex internal cell structure of animals including programmed cell death which can be triggered after application of substances . We also examine whether AgNPs induce oxidative stress in yeast compared to F. candida, because oxygen radicals are believed to be a key element of apoptotic execution in yeast  and the results should possibly be able to draw the link of molecular toxicity of AgNPs to other higher eukaryotes. The experiments were conducted using nanosilver NM-300 K, a reference AgNPs recommended by OECD. The NM-300 K is a well-characterized silver nanoparticles by the European Commission Joint Research Centre (JRC 2011). Briefly, NM-300 K is colloidal silver with a nominal silver concentration of 10% (w/w). NM-300 K is stable over a period of 12 months by UV–VIS analysis. The elution of silver ion from NM-300 K embedded in a poly-acrylic matrix to the physiological phosphate buffer and de-ionized water was 0.01% (w/w) and reached equilibrium after 5 days, and no further increase of silver concentration in the elution media is observed . To roughly determine the silver ions in AgNO3 solution, 20 mL of 0.1 g/L AgNO3 was precipitated into silver chloride using 300 µL of 1 M HCl. The silver chloride was then filtered from the solution through 0.2 µm pore size membrane filter (Schleicher & Schuell, Dassel, Germany) by a vacuum filtration system and weighed. An amount of silver ions was calculated based on the ratio of atomic weights of silver chloride, which is ca. 75.26% by weight. Folsomia candida (Collembola) of European origin was propagated in synchronized laboratory culture according to OECD guideline 2009 . Briefly, Collembola were kept in plastic boxes filled with 50 g of a mixture of calcium sulfate hemihydrate (Sigma-Aldrich, Taufkirchen, Germany) and activated charcoal (Fluka, Buchs, Switzerland) in a ratio of 9:1 (w/w) and cultured at 20 ± 1 °C, a light:dark cycle of 12:12 h. Containers were kept moist at all times ensuring that relative humidity of the air within the containers is close to the saturation. Collembola were fed with 0.01 g of granulated dried baker’s yeast (Dr. Oetker, Bielefeld, Germany) placed directly on the surface of the culture substrate in a small heap twice a week. Animals aged 40–60 days were used in all experiment (adapted from OECD guideline to obtain only adults, which are more tolerant to the sucking device during collection than juveniles). Per assay, 100 synchronized individuals of F. candida were placed in a plastic box lined with a culture substrate saturated with 5 mL of 0.01, 0.05, and 0.1 g/L AgNPs (ras material GmbH, Regensburg, Germany) and AgNO3 (VEB, Dresden, Germany) for a period of 48 h (7 boxes/one concentration) yielding 1-, 5-, and 10-mg AgNPs/kg culture substrate and 1-, 5-, and 10-mg AgNO3/kg culture substrate. Water was used as control. Animals were fed on the first day with dried baker’s yeast (Dr. Oetker, Bielefeld, Germany) and kept in incubator at 20 ± 1 °C, a light:dark cycle of 12:12 h. At the end of the test, animals were fixed in liquid nitrogen and used for RNA extraction and determination of GST activity and GSH pool. The dose of AgNPs and AgNO3 can be calculated as follows: each test vessel contains 50 g of culture substrate. 5 mL of AgNPs and AgNO3 (0.01, 0.05, and 0.1 g/L) was added on the surface of the substrate. Exemplarily for the 0.1 g/L AgNO3, 5 mL contains 0.5 mg AgNO3 added to 50 g of culture substrate corresponding to 10 mg AgNO3/kg culture substrate. In the same way, 5 mL of 0.1 g/L AgNPs contains 0.5 mg AgNPs added to 50 g of culture substrate, which is corresponding to 10 mg AgNPs/kg culture substrate. Quantitative real-time PCR was performed on an ABI Prism®7000 sequence detection system (Applied Biosystems, Massachusetts, USA) with three technical replicates per sample. Relative quantification of GST and MTC expression was carried out using Platinum® CYBR® Green qPCR SuperMix-UDG with ROX (Invitrogen, Carlsbad, USA). Each reaction was done in a final volume of 10 µL containing 2 µL of ten-fold diluted cDNA and 8 µL of master mix. Cycling conditions were kept constant for all assays. Primers for target and reference genes are listed in table below. The characterization of reaction products was done via melting curve analysis and gel electrophoresis to make sure that no formation of primer-dimer exists. Threshold cycle (Ct) for the gene of interest in both the test samples and control sample were adjusted in relation to a reference gene using the comparative quantification algorithms-ΔCt (Table 1). The activity of glutathione S-transferases was determined according to Shen and Chien . Briefly, assays were performed by recording the first 2 min of GS-CDNB conjugation at 25 °C in the reaction mixture consisting of 100 µL of 50 mM GSH (Sigma-Aldrich, Taufkirchen, Germany), 40 µL of 50 mM 1-chloro-2,4-dinitrobenzene (CDNB) (Sigma-Aldrich, Taufkirchen, Germany) dissolved in ethanol, 10 µL of enzyme extract and 0.1 M potassium phosphate buffer, pH 6.5, in a total volume of 2 mL . The reaction was started by the addition of enzyme extract and monitored at 340 nm in Beckman Coulter DU® 800 spectrophotometer (Beckman Coulter, Krefeld, Germany). Activity was calculated using an extinction coefficient of 9.6/mM/cm as described by Habig et al. . Total protein was measured according to the method of Bradford using bovine serum albumin (Bio-Rad, Hercules, USA) as a standard . 1 mL of Bradford reagent (Bio-Rad, Hercules, USA) was added to 20 µL of protein standard and unknown samples. The mixtures were then incubated for at least 5 min at room temperature and measured the absorbance at 595 nm. The standard curves were generated by plotting the absorbance at 595 nm versus their concentration and the unknown sample concentration was determined using the standard curves. Specific activity is defined in unit/mg protein (unit = µmol/min). Pools of F. candida from each test condition were ground in liquid nitrogen and 5 volumes (w/v) of sodium-phosphate buffer (143 mM, pH 7.5) containing 10 mg/mL polyvinylpyrrolidone K30 (to hinder browning of the extract resulting in higher yield of GSH during detection). The samples were centrifuged at 20,000g for 10 min at 4 °C. The supernatants were collected and determined for total GSH using a standard enzymatic recycling assay in the presence of glutathione reductase (GR) (Sigma-Aldrich, Taufkirchen, Germany) as described by Griffith  and Gruhlke et al. with minor modifications. Briefly, GSH was oxidized to GSSG by 5,5′-dithiobis-(2-nitrobenzoic acid) (DTNB) (Sigma-Aldrich, Taufkirchen, Germany) and catalyzed by GR in the presence of NADPH (Carl Roth, Karlsruhe, Germany). The rate of formation of 2-nitro-5-thiobenzoic acid is proportional to the glutathione concentration and was monitored at 412 nm over the period of 2 min and the size of the GSH pool was calculated from a prepared standard curve. After chemical exposure, test animals were inactivated with nitrogen gas and then fixed in 95% ethanol for a few second. Later, they were washed in phosphate buffer saline (PBS) and finally incubated with PBS buffer containing DCFH-DA (Sigma-Aldrich, Taufkirchen, Germany) for 30 min. After incubation, test animals were washed again in PBS buffer and then placed on a glass slide. The fluorescence can be visualized at 535 nm when excited at 485 nm using Leica DMR microscope (Leica Microsystems Wetzlar GmbH, Wetzlar, Germany). Image analyses were conducted on three individual biological replications. Yeast strain BY4742 and mutant derivatives (see table below) were obtained from Euroscarf, University of Frankfurt, Germany. 6 mutants of yeast strain were grown on YPD agar plates (10 g/L yeast extract, 20 g/L peptone, 20 g/L glucose and 20 g/L agar) at 28 °C. Later, the culture was inoculated and allowed to grow overnight in liquid complete synthetic drop-out medium (CSM) containing 7 g/L yeast nitrogen base (ForMedium, Hunstanton, Norfolk, UK), 0.8 g/L complete dropout (Vista, CA, USA), and 40 g/L glucose (Carl Roth, Karlsruhe, Germany) at 28 °C with shaking speed 210 rpm (Table 2). Yeast strains were adjusted to an OD600 = 0.2 and exposed to AgNPs and AgNO3. Controls were treated with CSM medium alone. Tests were conducted in 96-well plates using different concentrations of test substances. Dilution of AgNPs and AgNO3 was done using CSM medium. The highest concentration of test substances was transferred to the first row of the plate. Half volume of the test substances in each well from the upper row was transferred to the second row and mixed with the same volume of CSM medium. This manner was repeated with the lower row to obtain all test concentration used. Each test concentration was performed in triplicate. Cultures were incubated for a further 24 h at 28 °C, 210 rpm. Toxic effect of substances was assessed via growth of yeast strains by measurement OD600 using plate reader (Berthold Technologies, Bad Wildbad, Germany) and the viability of yeast was assessed via colony formation on CSM medium (please see Additional files 1, 2, 3). Overnight yeast cultures were adjusted to OD600 = 0.5 and treated with 3.125-, 6.25-, 12.5-, 25-, and 50-mg/L AgNPs and AgNO3 in 24-well plates and incubated for a further 24 h (28 °C, 210 rpm). 95 µL of test composition in each well was transferred to black flat bottom 96-well plates (repeated 4 times so that 95 µL of test component from the same 24-well plate would be in 4 wells of black 96-well plate). 5 µL of 10 mM DCFH-DA was added to each well and incubated for 30 min. Emission of fluorescence was detected (excitation at 485 nm and emission at 535 nm) using plate reader (Berthold Technologies, Bad Wildbad, Germany). Deionized water was used to get an end concentration of 0.1 g/L AgNO3 and the amount of silver ions was observed at 48 h. Silver ions from AgNO3 within 48 h were 49.42 ppm ± 5.13, which is approximately equal to 50% (w/w). Average threshold cycle (Ct) values obtained from qPCR varied between treatments with different concentrations of test substances and were normalized by reference gene (see “Methods” section). The alteration of the steady-state level of target genes (glutathione S-transferase, GST and metallothionein-containing protein, MTC) was found in both animals treated with AgNPs and AgNO3 (see Fig. 1). An up-regulation of GST and MTC increased with an increasing concentration of AgNPs. Collembola exposed to 5 and 10 mg/kg AgNPs presented ca. 4 and 4.5 fold up-regulation of GST and ca. 14 and 64 fold up-regulation of MTC when compared to control, whereas an up-regulation of both target genes could not be detected in F. candida treated with the lowest concentration of AgNPs (1 mg/kg). In case of silver salt exposure, compared to control group, GST- and MTC mRNA steady-stated level was significantly changed in the group treated with 5 mg/kg. Alterations of both target genes declined when animals were treated with the highest salt concentration (10 mg/kg AgNO3). At this concentration, the expression level of GST could not be detected, whereas the expression of MTC was two hundred times higher than that in the control. GST was extracted from test animals and activity was measured using 1-chloro-2,4-dinitrobenzene (CDNB) as a model substrate (see Fig. 2). GST activity exhibited a decrease–increase–decrease manner in 1-, 5-, and 10 mg/kg AgNPs-treated animals, respectively. The highest GST activity was found in Collembola exposed to 5 mg/kg AgNPs (0.31 unit/mg protein). In case of AgNO3, GST activity presented an increase–decrease–increase manner. The highest activity was detected in animals exposed to 1 mg/kg AgNO3 (0.32 unit/mg protein). GSH amount of test animals decreased with increasing concentration of nano-silver and silver salt (see Fig. 3). In the control group, GSH concentration in the extracts of Collembola was 81.91 µg/mL. On the other hand, 57.41, 40.07, and 10.71 µg/mL GSH were found in extracts of Collembola treated with 1, 5, and 10 mg/kg AgNPs, respectively. In groups treated with 1, 5, and 10 mg/kg AgNO3, GSH concentration in the extracts was 59.56, 36.52, and 25.52 µg/mL, respectively. To obtain the direct evidence whether AgNPs cause oxidative stress to F. candida, RS formation was monitored. From Fig. 4, comparing to control, the tendency of increased fluorescence intensity of 2′,7′-dichlorofluorescein (DCF) was observed in both AgNPs- and AgNO3-exposed animals. The highest fluorescence intensity was found in positive control (animals were treated with 0.01 M H2O2), which shows the highest fluorescence intensity compared to the untreated control. Since qualitative method alone was not precisely enough to illustrate the formation of RS, we exploited the quantitative method to measure RS after chemical exposure in yeast. A toxic effect of AgNPs and AgNO3 (compared to control) was investigated with yeast strain BY4742 and its mutant derivatives by measuring absorbance at 600 nm after 24 h of growth (see Fig. 5). For wild-type (BY4742), the absorbance values from control, 0.78, 1.56, and 3 mg/L AgNPs and AgNO3, were roughly the same. At the concentration of 6.25 mg/L, the absorbance value of yeast treated with AgNO3 sinks to 0.85 and continued to sink when yeast cells were exposed to higher and the highest concentrations. Yeast cells treated with AgNPs obtained similar absorbance values to control using the test concentration below 25 mg/L. In case of chemical exposure in cells lacking the cytosolic catalase gene (ctt1), at 1.56 mg/L AgNO3, the optical density (OD) was 0.4 and began to sink when using higher concentration of substance. At and above 3 mg/L AgNO3, the OD values were constant. The absorbance values of ctt1 treated with AgNPs were similar to control when exposed to concentrations 0.78 and 1.56 mg/L. From 3.0 mg/L AgNPs, the absorbance values were lower than control, whereas at 12.5- and 25 mg/L AgNPs, the absorbance values were similar to the mutant treated with AgNO3. OD values of cells lacking the cytosolic superoxide dismutase gene (sod1) treated with the first two lowest concentrations of AgNO3 were alike control and began to sink when treated with 3 mg/L. Afterwards, (from 6.25 to 25 mg/L) the values remained at the same level. Oppositely, all OD values obtained from mutant exposed to different concentrations of AgNPs were similar to control. In case of sod2 mutant (lacking of the mitochondrial superoxide dismutase gene), absorbance values decreased with increasing concentration of AgNO3, while in mutant treated with AgNPs the values were similar to control and began to decline at 6.25 mg/L AgNPs and remained the same when treated with higher concentration. Mutant lacking the gene for GSH synthesis (gsh1) exposed to AgNPs and AgNO3 obtained roughly the same OD values compared to control, except the last two highest concentrations that the values decreased in mutant treated with AgNO3. The OD values obtained from gsh2 decreased with increasing concentrations of AgNPs and AgNO3. From the results obtained from toxicity test in yeast (please see Fig. 5), the concentration above 3 mg/L caused effects. Thus, we chose this concentration for DCFH-DA-based fluorescent assay. The viability of yeast treated with AgNPs and AgNO3 was assessed on CSM-agar before conducting ROS test. The colony formation indicated that yeast cells were not dead (please see Additional files 1, 2, 3). From Fig. 6, different concentrations of AgNPs and AgNO3 induced ROS formation in yeast distinctly. In all yeast strains treated with AgNPs (except gsh1), maximum relative fluorescence values were found in the lowest AgNPs concentration used (3.125 mg/L) and then began to fall when the test concentration increased. Finally, the values remained approximately constant. Conversely, the maximum relative fluorescence value in gsh1 was obtained in control. In yeast strains exposed to AgNO3, the similar pattern of relative fluorescence values was detected in gsh1, ctt1, sod1, and sod2. Namely, the highest fluorescence value was detected in 12.5 AgNO3-treated strains and consequently dropped as the test concentration increased. In wild-type, the highest relative fluorescence value was observed in the group treated with 25 mg/L AgNO3. By contrast, relative fluorescence tended to increase with increasing concentration of AgNO3 in gsh2. To answer the hypothesis that the toxic effect of AgNPs is caused by the combination of its nano-size specific properties and the generation of their ions , several experiments have been performed in the present study. At the molecular aspect, an alteration of the steady-state level of metallothionein- and glutathione S-transferase mRNA was chosen as ecotoxicological endpoint for AgNPs exposure in F. candida (in comparison to silver salt, AgNO3). We exploited the expression of MTC as biomarker to assess whether the toxic effect of AgNPs is possibly caused by the release of silver ions. An up-regulation of MTC was found in both AgNPs- and AgNO3 treated groups, which could point to the evidence that silver ions were released from AgNPs and promoted transcription of MTC leading to an alteration of the steady state of MTC mRNA. Consequently, an up-regulation of this gene could then be detected compared to control animals. An up-regulation of the target gene in AgNO3-treated groups was however higher than that in AgNPs-treated groups. This would possibly be due to the higher amount of free silver ions in the silver salt solution than the one released from AgNPs, when using the same test concentration based on the total silver content. The rough determination of Ag ions in AgNO3 was approx. 50% (w/w) and the release of Ag ions from AgNPs reported by Klein et al. found to be 0.01% (w/w) . Thus, the amount of silver ions from AgNO3 is more than the one released from AgNPs. The slow release of silver ions from AgNPs is indeed an important property of AgNPs which can strongly inhibit the growth of microorganisms such as bacteria, yeast and fungi . AgNPs are sensitive to oxygen and only partially oxidized AgNPs exhibit antimicrobial activity . This property of AgNPs is also related to their size, in which the smaller particles being more active when compared on the basis of equivalent silver mass content . Apart from the change of MTC mRNA steady-state level, an expression of a gene believed to encode glutathione S-transferase was also measured. GSTs are involved in detoxification of xenobiotics and reactive oxygen species (ROS). An up-regulation of GST was also observed in Collembola treated with AgNPs and AgNO3. Obviously, GST was up-regulated with increasing concentrations of the test substances, except in the group treated with the highest AgNO3 concentration in which the steady-state level of GST mRNA was nearly the same as in the control group. This is probably because the toxicity threshold was surpassed, as a further indication of toxicity under this condition; less mobility of animals in this group was observed compared to other test groups. The change of GST mRNA could possibly indicate oxidative stress which could occur during an exposure of AgNPs and AgNO3 as well as an involvement of GST in the removal of reactive oxygen species. At the molecular organization level, an up-regulation of target genes (GST and MT) from F. candida exposed to AgNPs provides evidence of the ability of the test animals to maintain homeostasis in a changing environment. This consequently drives organisms to the boundaries of their ecological niche and induces stress responses . Accordingly, Nota et al. reported that the identified biological processes, which are involved in environmental toxicity, can function as new genomic endpoints . This demonstration consequently points to the possibility of employing gene expression to examine the effects of chemicals on test organisms in toxicogenomic studies . Since the signal transduction pathways, in which stress affects gene transcription, is recently well-understood, this approach might suggest that the diagnosis of environmental quality by transcriptional profiling is possible . Nevertheless, when measuring steady-state levels of mRNA, one should keep in mind not to overestimate chemical toxicity on other organization levels (cells, individuals and population), because gene expression alone can sometimes be a poor predictor of protein abundance . At the cellular level, change of GST activity was not significant in both animal groups and no correlation between enzyme activity and the test concentration used could be observed. However, the enzyme levels are often increased by exposure of the animals to xenobiotics, because the binding of antioxidant response element (ARE) and Nrf1 and Nrf2 proteins allows increased transcription of gene encoding GSTs . This is possible because the used concentrations were not either fine enough or more chemical concentration in between should be tested in order to obtain the tendency of enzyme activity. From the Nernst equation, the concentration of GSH does not only influence the half-cell reduction potential (E hc), but also the buffering capacity of the cellular redox environment. The redox environment of a cell alters throughout its life cycle and moves cells through different biological stages. During proliferation, E hc for the GSSG/2GSH redox couple is at the lowest level, but increase when cells undergo differentiation. Beyond a toxic threshold of E hc, death signals are then activated and apoptosis is initiated. Very high values of E hc (GSH) are caused by severe oxidative stress, which will initiate necrosis as a path to cell death . This is a good example why cell with higher [GSH] might be more resistant to oxidative stress than cell contains lower one. The decrease of GSH amount of treated animals also could point to an involvement of oxidative stress upon chemical exposure, as xenobiotic disturb the redox status in organisms and cause an imbalance . From the fact that oxidative stress is involved in the initial stages of stress responses, and is responsive at low doses of chemical exposure, it could address a cause–effect relationship . Therefore, it may be possible to employ GSH level as an oxidative stress biomarker in ecotoxicological studies within environmental risk assessments. According to Mendes and co-worker, the amount of MT in F. candida treated with AgNPs and AgNO3 was increased at 48-h exposure and the amount of MT treated with the latter was higher than with the former one . Furthermore, at population level, a dose–response effect of AgNPs is lower than that of AgNO3 . The increased amount of MT at cellular level is directly correlated to an up-regulated MTC mRNA and might confirm the toxic effect to F. candida via silver ions released from AgNPs. The increased fluorescence of F. candida treated with AgNPs and AgNO3 could indicate the formation of RS and may support the fact that the amount of GSH decreased because it was exploited in detoxifying the metabolites from oxidative reactions. Indeed, the generation of ROS is one of the most common toxic mechanisms during AgNPs exposure in bacteria , roundworms , and human cells . However, RS formation in F. candida is difficult to quantify; eukaryote model organisms were employed as more informative analytical alternative. A number of yeast mutants, which are deleted in genes encoding oxidative stress-related enzymes such as superoxide dismutase (SOD), glutathione synthetase (GSH), and glutathione reductase (GR), were exposed to AgNPs and AgNO3. Such mutants would indicate towards a possible link between the missing enzyme and its cellular roles as well as the biochemical action of substances tested. In fact, for the enzymes of glutathione metabolism, the yeast genome has only one gene of particular enzyme, whereas for superoxide dismutases, the yeast genome contains one gene for a cytosolic (SOD1) and a mitochondrial (SOD2) enzyme, respectively . Because of this simple genetic accessibility of particular biochemical key players as well as an easy experimental handling of yeast, this organism could serve as a reasonable and advantageous system for chemogenetic screening . Interestingly, the chemogenetic analysis showed a significant toxicity of AgNPs and AgNO3 in yeast cells. However, as the distinct toxicity of AgNPs and AgNO3 is concerned, it is possible that yeast cells are either more sensitive to AgNO3 or can handle better with AgNPs. AgNPs are not toxic to strain lacking of copper-zink superoxide dismutase (sod1) and shown less toxic effects toward the gsh1 mutant. AgNO3, oppositely, was toxic to all strains. The possible involvement of reactive oxygen species was confirmed by assessing the oxidation of the non-fluorescent probe DCFH-DA . The fluorescence caused by the AgNPs and AgNO3 exposure relative to that in control organisms was measured. The formation of ROS derived from AgNPs and AgNO3 exposure was detected in all mutant strains, which was similar to the data obtained from the former experiment conducted with F. candida. Since the limitation in quantifying RS level in F. candida could be circumvented by exploiting yeast and all mutants. The yeast-based screening is thus an informative alternative, and could potentially be used as a model organism for exposure to xenobiotics within an ecotoxicological context , particularly in the application of oxidative stress-related mechanism, because yeast possesses a cellular redox chemistry which is comparable to higher eukaryotes albeit in a less complex manner  or even to understand the correlation between oxidative stress and disease development . Toxic effects of AgNPs on F. candida may be caused either by the combination of the release of silver ions and RS formation, or by the release of silver ions, which consequently leads to formation of RS. Furthermore, exposure with AgNPs generated significant levels of ROS in eukaryote model organisms. In comparison, silver nitrate and nanosilver have similar effect on both molecular and cellular level of test animals. However, the former induced a higher degree of MTC up-regulation, which is likely due to a higher amount of free silver ions within the test environment. One should further determine the exact amount of silver ions with the suitable equipment. Our results provide a basis for testing the impact of chemicals in Collembola on a sub-lethal molecular and cellular level. 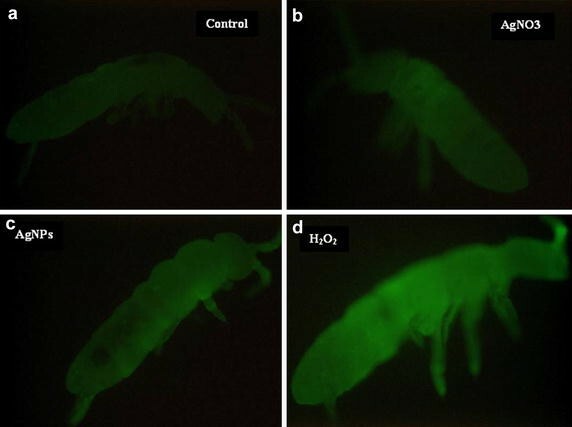 However, the toxicity of AgNPs to Collembola using an artificial substrate instead of soil must be considered with care because in soil environmental processes such as leaching and sorption may lead to different results. PS designed and performed experiments, analyzed the data and wrote the manuscript. MCHG constantly involved in design and interpretation of the experiments. AS participated in the conception throughout the study. All authors read and approved the final manuscript. This study was sponsored by the Ministry of Science and Technology, Thailand. The authors would like to thank Prof. Alan J. Slusarenko for advice and permission to use facilities in his laboratory. The authors also specially thank Prof. Juliane Filser (University of Bremen, Germany) for kindly providing the F. candida culture and Dr. Kilian Smith for revising this manuscript. 12302_2016_95_MOESM1_ESM.docx Additional file 1. Standard curves. 12302_2016_95_MOESM2_ESM.docx Additional file 2. Yeast colony formation. 12302_2016_95_MOESM3_ESM.docx Additional file 3. Fluorescent intensity relative to control.